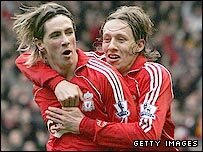 Fernando Torres grabbed a hat-trick as Liverpool came back from a goal down to beat Middlesbrough and move fourth. The Reds went behind when Tuncay Sanli headed in from six yards before Julio Arca's mistake let Torres around keeper Mark Schwarzer to slot in and level. Torres rifled in from 22 yards and side-footed in a third after Schwarzer rushed out of his goal without success. Stewart Downing poked in a shot for Boro but the Reds held on with the help of Jeremie Aliadiere being red-carded. The win was only Liverpool's second in the top flight since the turn of the year and came after a poor start when they quickly went behind following some terrible defending. Boro striker Tuncay timed his run perfectly to move unmarked through Liverpool's flimsy offside trap and nod in Downing's free-kick. How good is Fernando Torres? The visitors have been an improving side in recent months and, while they showed plenty of energy in closing the Reds down, they also threatened with some promising attacking play. Only a last-ditch Alvaro Arbeloa tackle on Boro striker Aliadiere stopped him breaking clear on the Reds goal. But Liverpool were gifted an equaliser when midfielder Arca's header back towards his own goal went straight into the path of Torres and he capitalised on the error by equalising. Torres added a second in as many minutes when he gathered the ball and powered a low shot into the bottom corner. Boro refused to let the double blow change the way they played in an open game but had Tuncay booked when he put a cross into the net with the top of his arm. 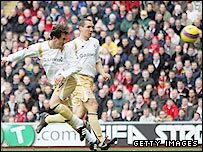 Gary O'Neil shot wide against a Liverpool side that looked dangerous when going forward but uncertain at the back with the suspended Jamie Carragher missing. Middlesbrough attacked with a purpose but were undone by defensive mistakes. A long cross-field Liverpool pass brought Schwarzer rushing out of his goal to the edge of the box but Torres got to the ball ahead of him and central defender David Wheater before side-footing into an empty net. Downing beautifully controlled and cut into the Liverpool box from the left late on before slotting a shot through the legs of keeper Pepe Reina to haul his side back to 3-2. Aliadiere then was sent-off for Boro after lightly slapping Javier Mascherano, who appeared to provoke him by raising a hand to the striker's face. The dismissal all but ended Boro's attempts to get a late equaliser as Liverpool held on for victory. "Fernando was really aware and ready and scored when they made mistakes. "He has scored 21 goals this season which is really good in his first season with the club and he is enjoying his time here. "It was an important game for us after our Champions League game. "But we are now in the top four and we have a game in hand so we are in a good position." "It shows the progress that we have made because we are disappointed not to have got something out of the game. "We win and lose together and that is why we have been on such a good run. "We have pushed a top side on their own turf right to the end. "We had the belief coming here that we could get something out of the game and we nearly did." Liverpool: Reina, Finnan, Arbeloa, Hyypia, Aurelio, Kuyt (Riise 73), Lucas, Mascherano, Babel (Benayoun 62), Gerrard, Torres (Crouch 90). Subs Not Used: Martin, Skrtel. Goals: Torres 28, 29, 61. Middlesbrough: Schwarzer, Young, Wheater, Grounds, Pogatetz, O'Neil (Mido 59), Rochemback, Arca, Downing, Aliadiere, Sanli (Alves 69). Subs Not Used: Turnbull, Boateng, Hines. Booked: Aliadiere, Sanli, Wheater, Rochemback, Young. Goals: Sanli 9, Downing 83. BBC Sport Player Rater man of the match: Liverpool's Fernando Torres on 9.54 (on 90 minutes).